To make the crust, in a large mixing bowl, stir together flour, sugar and salt. Work the butter in, using a pastry blender or your fingers, until pea-sized lumps form. Sprinkle in the water, 1 tbsp. at a time, stirring gently with a fork after each addition and adding only enough of the water to form a rough mass. Using floured hands, pat the dough into two smooth, flattened discs. Wrap in plastic wrap and chill in the freezer for 20 minutes before rolling out. Meanwhile, stir together blueberries, sugar, lemon juice and cornstarch until well combined. Roll one dough disc out thinly on a floured surface, using a rolling pin, and fit into a 9-inch pie plate, place on a cookie sheet; fill pie shell with blueberry mixture. Roll out additional dough disc and top blueberry mixture; trim and flute edges. Brush the pie with a little bit of cream or milk, if desired. Sprinkle with coarse sugar, if desired. Bake for 20 minutes. Reduce heat to 350 degree and bake an additional 35-40 minutes or until golden brown. Cool completely on a wire rack. 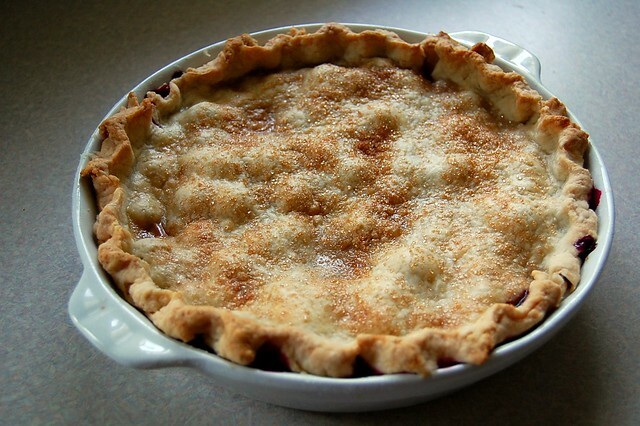 26 comments on "Blueberry Pie"
Blueberry pie has always been my favourite! 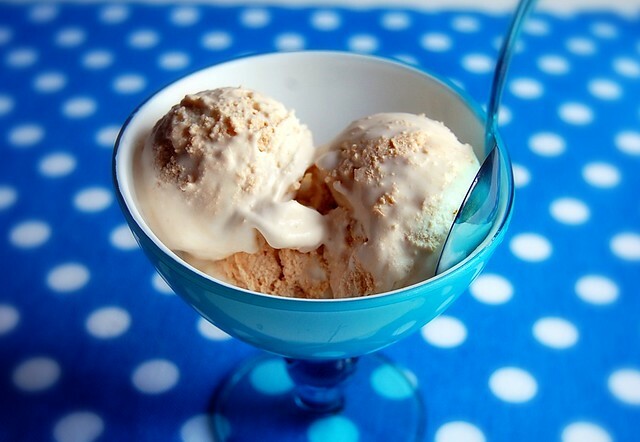 It's one of the treat that my dad prefer, this one looks good, espacially with this iced cream! My dad LOVES blueberry pie, too...yours came out so beautifully, Emily! I think you win the daughter of the year award for that dessert. I like how classic this recipe is. No spices or extra random things involved. Just a buttery crust and berries. I have never made blueberry pie, I think because I have only had bad ones. I need to try this and redeem my image of blueberry pie! I totally made blueberry pie for father's day as well! Great minds bake alike! And yeah. Coffee early is key. I'm a little late on this since I let my Google Reader run wild over the weekend, but I have a few Chicago suggestions. Since you don't have a lot of time and some boat tours can be pricey, check out the Chicago Water Taxi. You can actually take it from around the School (or even the train station) to Michigan Ave and more. As for food, I second XOCO. They do breakfast, lunch and dinner and it is first come, first served unlike Bayless's other restaurants. They are closed on Sunday and Monday. If you do happen to go when the line it too long just order your food to go--you get to cut the line--and make it a picnic. Don't forget the churros! I also really love the Spice House. You'd think it would be expensive but I think it is cheaper (and way fresher) than buying spices at a grocery store or even Walmart. So worth it. As for cupcakes, if you're into that sort of thing, I really love MORE Cupcakes. morecupcakes.com Sprinkles is only a block away, if you want to hit up two places at once, and both are just steps away from Michigan Avenue. Pierrot Gourmet inside the Peninsula makes the best macarons, if you happen to be over that way (peninsula.com). Two restaurants that I really love in the downtown area are The Purple Pig (thepurplepigchicago.com) which is somewhat adventurous and Sable Kitchen and Bar (sablechicago.com) which is really yummy comfort food. Sable is also my favorite bar thanks to Mike Ryan, the head bartender. I don't even order off of the menu; I just tell him what I'm feeling like and he knocks it out of the park. 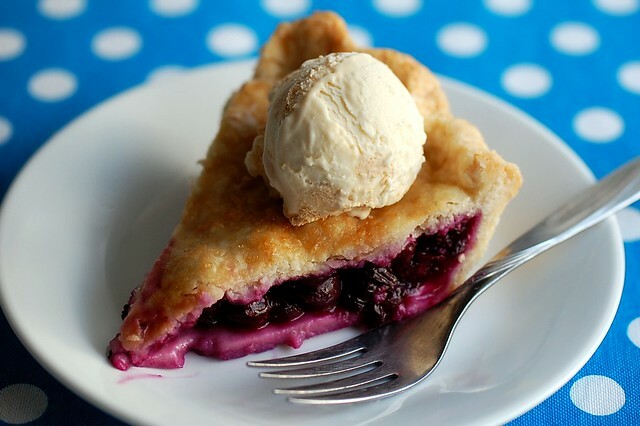 I just love blueberry pie, it's one of my favorite deserts. I'm so excited about your pastry school, do you plan on starting soon? It looks divine, Emily! I just adore your blog and am thrilled to have found it! We live in Springfield, MO, so we are your neighbors - and we watched you and cheered you on when you competed on the two Food Network competitions! And I think that you might have been our server at Lambert's a long time ago! Blueberry pie is one of my dad's favorite desserts too. Maybe it's a dad thing. I'm just curious - from the pictures of the pie it looks like you didn't cut vents. I always thought it was good to cut slits so that the steam can escape. Is that not true with blueberry pie, or do you think it doesn't really make a difference? oooh I just bought a bunch of blueberries and people keep suggestion to make blueberry pie. This looks divine! Classic blueberry pie sounds good to me!! And now I'm about to check out these health newsletters you linked... it's all about balance, right? Rachael, perhaps we are! Mmm blackberries. Jenny, thanks for all of the advice! Wow, you really know Chicago. I would love to go to the Spice House if we stumble across it. XOCO sounds amazing! I really, really want to go. I think we might take one of those water taxis! 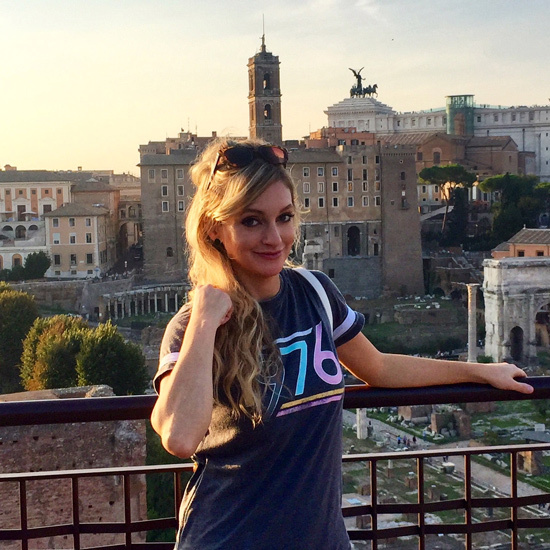 Jcarden, thanks for visiting! I'm glad you like it. :) Thank you for watching the show, too. Did I?! That's funny. I hope I wasn't in too bad of mood. Haha. I'm not the happiest when I'm at work. Shannon, hi! You know what? I've cut vents and not cut vents in pies... I can't tell a difference! That is one really beautiful blueberry pie! I love pie. I'm sure you made your dad happy. Can't wait for the custard recipe! Blueberry pie is my favorite fruit pie (well, maybe cherry too -hard to say). It's a pie that never needs any improvement. It's great iwth just blueberries, crust, and sugar. This looks so yummy! I've been wanting to make a big summer feast with blueberry pie as dessert. It is one of my favorites! Mmmmm, just had a pie like this with my mom last night. So good! 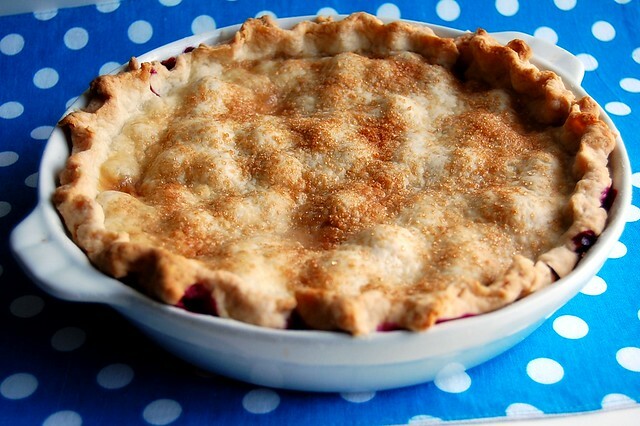 Your pie looks picture perfect. 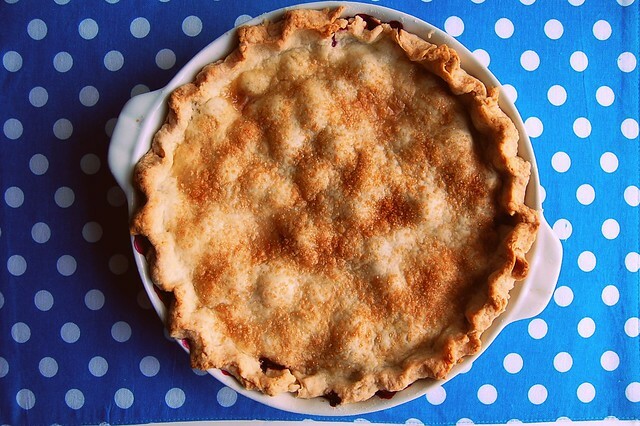 Nothing beats a classic blueberry pie. Yumm, I love blueberry pie. We used to pick fresh huckleberries (blueberries' wild cousin) off the bushes by our summer house and make pie out of them. Totally reminds me of carefree summers :) How I miss the days of worry-free living and not having a job! That is probably the most perfect looking pie I have ever seen.